Posted in: A Walking Tour of Old Ravenswood. 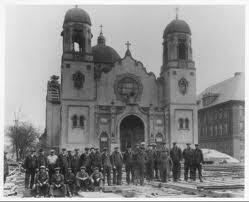 Tagged: 1601 W Leland, building relocation, grotto, Henry Worthmann, J. G. Steinbach, Our Lady of Lourdes Church, St. Mary of the Angels Church, St. Nicholas Ukrainian Catholic Cathedral, street widening. Many stone details and tile and copper trim enliven a yellow brick structure. Also note cast iron lamps outside doors; metal fretwork over front door; and dome with copper lantern at crossing. The church’s cruciform floor plan, large windows, high ceilings and grand size make for an inspiring worship experience. Henry Worthmann (1857-1946) and J. G. Steinbach also designed, among many other churches. St. Mary of the Angels on Hermitage Avenue just south of Armitage Avenue, and St. Nicholas Ukrainian Catholic Cathedral, 2238 West Rice Street at Chicago Avenue. This church was designed in a Spanish Romanesque style; the architects were equally at ease designing Renaissance and Neo-Byzantine structures. In 1929 this church was moved across Ashland Avenue and turned 90o, one of the largest building relocation projects in US history. Due to the need to widen Ashland Avenue, the church: whose front door previously faced Ashland from the southeast corner of Ashland and Leland, was moved across Ashland in early 1929 so that its front door now faces Leland. It was also lengthened 30 feet, increasing the seating from 800 to 1,370. Today, the church serves a very large congregation with a large number of masses, all well attended. One of its most unusual ministries is a small chapel just west of the church’s south end (accessible off the alley west of the church). This chapel, which simulates the Grotto at Lourdes, France, houses the Blessed Sacrament. Is continuously manned by volunteer laity from the parish 24 hours a day, 365 days a year. 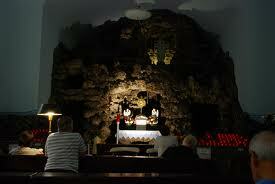 This means that anyone can go to this church at any time to pray in the grotto. It is often quite crowded. Original Permit was A12954 on 5/28/1913, N5, page 135, 87411, file 39365. A second permit, presumably for the move, was 28038 on 8/31/1928 (Plan AB340; Water 13575; File 196741; N$$, page 201). See also George Lane’s Chicago Churches and Synagogues (Chicago: Loyola University Press, 1981), and History of the Parishes of the Archdiocese of Chicago Volume I, published 1980 by the Archdiocese, pages 701-706. Continue the tour to Chase Park, diagonal from the church. The next destination is diagonally across the street, about 33′ from you.